Designed by Peter Philips to harmonize with the opulent hues and effects of his Metallics on eyes, face and nails, the new Rouge Dior shades for fall 2017 flaunt strong beauty with a distinguished chic style. Its iconic formula offering 16 hours of comfort* ensures that women feel good, regardless of the color or finish. 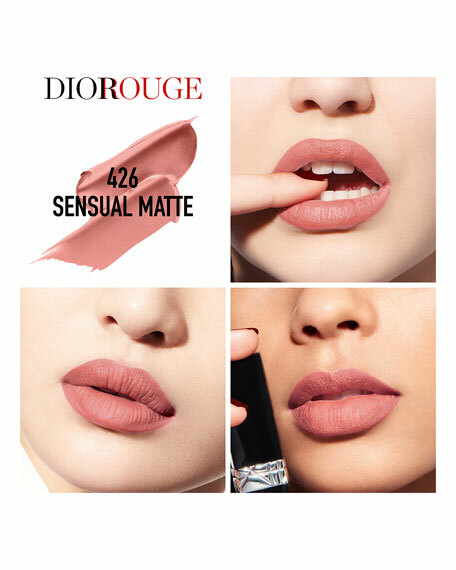 The voluptuous Rouge Dior formula provides 16 hours* of comfort without drying or color streaking, in both matte and satin finishes. It includes a unique combination of "lip care" ingredients that target optimal comfort and lasting hold. The formula is enriched with natural hydrating mango butter along with Aroelat Samphira for its revitalizing action**, the filling properties of hyaluronic acid spheres, Decox for a volume effect on the surface and the lipid-restoring action of Lipelex. Start by lining lips with Dior Contour. For perfectly even results, apply lipstick with the Backstage Lip Brush, working from the center of the lips outwards. For a bolder color finish, apply the lipstick directly on the lips. Each shade delivers the same intense color as ever, now enhanced with a hint of mystery and a dash of lamé: Sensual Matte, a pretty, irreverent beige. Hypnotic Matte, a fervent rosewood. Ultra-pigmented and luminous couture colors with optimal comfort and long-lasting wear.